This action actually has an official name, which is the play bow. As you can probably guess from that name, when a dog bows in this way, it’s because they’re ready to have fun with you. It’s also worth noting that plenty of dogs complement their bow by “smiling.” Unlike an expression that involves showing teeth and could indicate aggression, a play smile simply involves a dog pulling their lips back horizontally. Before we get into the best way to respond when your dog bows to you, we want to share a few other fun facts about this action. One interesting detail of the play bow is it’s not influenced by social hierarchy. Another is that if dogs start playing with each other and one accidentally gets too rough, the other may use a play bow as a way to apologize and ensure the play continues. In addition to all the fun elements of a play bow, dogs who haven’t been properly socialized may not know how to respond to this action from other dogs. Any dog owner can correct that issue by enlisting help from an experienced dog trainer. Now that you know exactly what this bow means, you may be wondering how to respond to it. The simple answer is to start playing with your dog. Whether that means a little fetch or playfully chasing your dog around, this type of fun should be a great experience for you both. And if you’re the one who’s feeling playful, you can almost always get a dog on the same page by doing a play bow yourself! 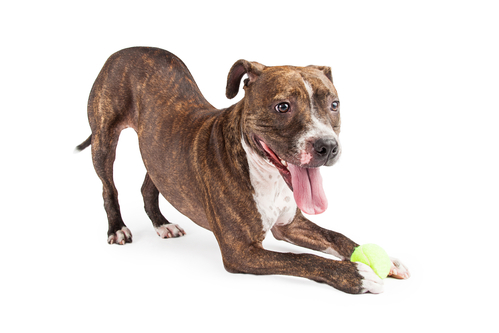 Active play on a regular basis is an important part of a dog’s healthy lifestyle. You can help provide your dog with the daily energy it needs to feel great by feeding one of our high-quality dog food blends. Freeze dried dog food made with carefully selected vitamins and minerals. This food ensures your dog is getting the balanced nutrition he needs with all the rich, red-meat taste of beef dogs crave.